The tiny island of Bequia in The Grenadines - one of my favorite Caribbean escapes! The Grenadines are know as the "Jewels of the Caribbean"
Bequia Beach House is a stunning boutique property featuring just 41 premier beach resort villas. The free night offer includes Continental Breakfast, and if booked now is available for travel through August 31, 2013. Ocean View Suite - the most spacious accommodation with king, queen or twin bed options, all rooms feature covered terraces with seating overlooking the gardens and sea, large en-suite bathroom. One Bedroom Villa with garden view featuring either twin or king size bed. Contemporary colonial interior, with covered terrace, and small garden. Amenities include en-suite bathroom, walk-in closet. Classic Pool and Sea View Room - Each room features its own private terrace, overlooking the pool with views of the sea in the distance. Spacious double bed, air conditioning, bathroom with shower. Family Suite, Sea View Room - Similar to the classic pool and sea view rooms, however these rooms feature an additional and interconnecting separate twin bedroom (both with en-suite bathrooms). Ideal for families and entertaining with a large private balcony overlooking the Pool, sun deck and beach. 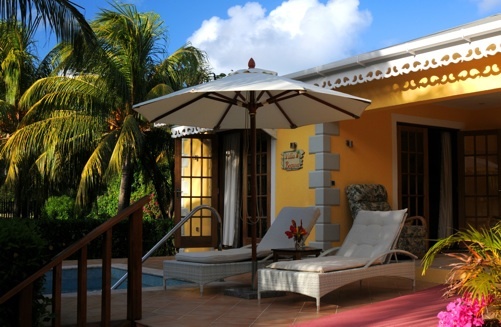 Private Villa with Plunge Pool - Perfect for families this two-bedroom villa features en-suite bathrooms, with combined living room/kitchenette, and covered private terrace. Penthouse Suite Sea View - Perfect hideaway for honeymoon couples or guests looking for privacy and luxury. The suite features a separate living room and bedroom with king-sized bed and two jacuzzis; the first in the large bathroom, the second on the large private terrace with the best views the hotel has to offer. The hotel’s main restaurant ‘Bagatelle’ is located right on the stunning Friendship Beach with the ‘Bequia Beach Bar’ just a few feet away. The on site restaurant offers an internationally inspired menu with classic Caribbean influences and dishes. When booking your room directly with Bequia Beach Hotel, travelers can book the SVG Air connection from Barbados to Bequia. Also Mustique Airways private transfer from Barbados to Bequia is available to Bequia Beach Hotel guests.